Hawaii's beautiful and rich ecosystem includes some of the most colorful and beautiful marine life the world has to offer. The miles of untouched reef produces life that can be found nowhere else in the world including a large list of fish indigenous to Hawaiian waters. 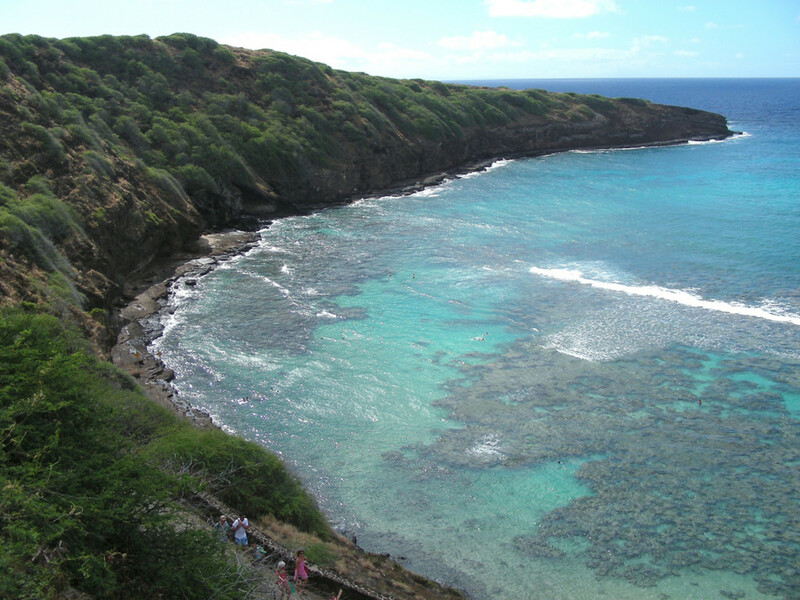 Because Hawaii is not extremely developed on land, the ocean remains untouched in some areas. Due to the islands' shapes after years of uplift and erosion, it is common to see reef that survives very close to shore. 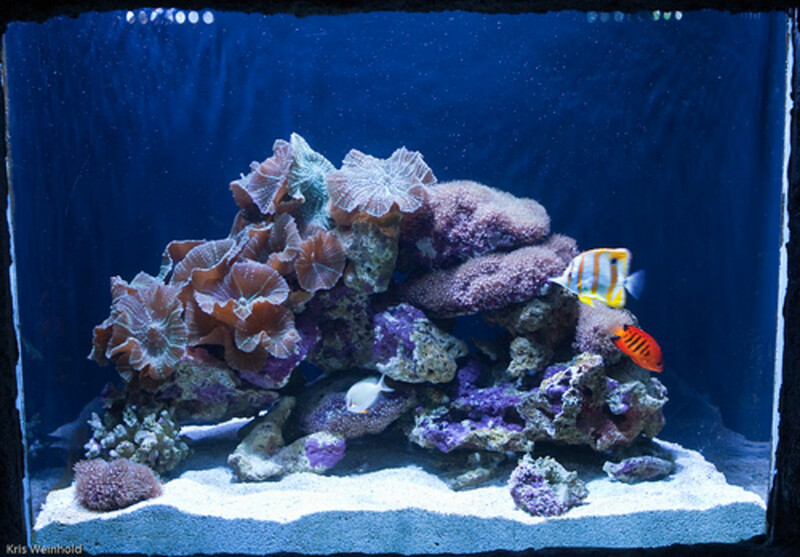 In the photo above, you can see the coral as it sits right up against the shoreline. 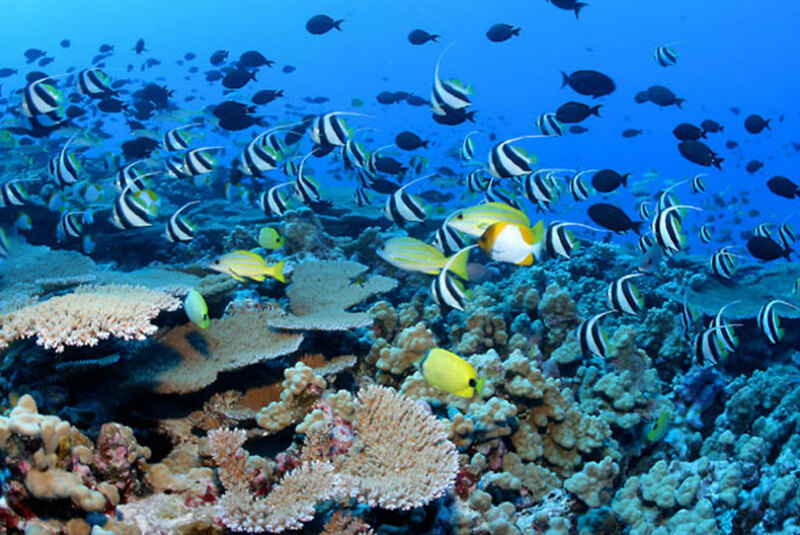 Shallow reef fish and over 200 species of coral can be found in Hawaiian waters. Below is a table of the most common species found in Hawaiian reef. This table shows the fish commonly found in the shallow, Hawaiian reef. 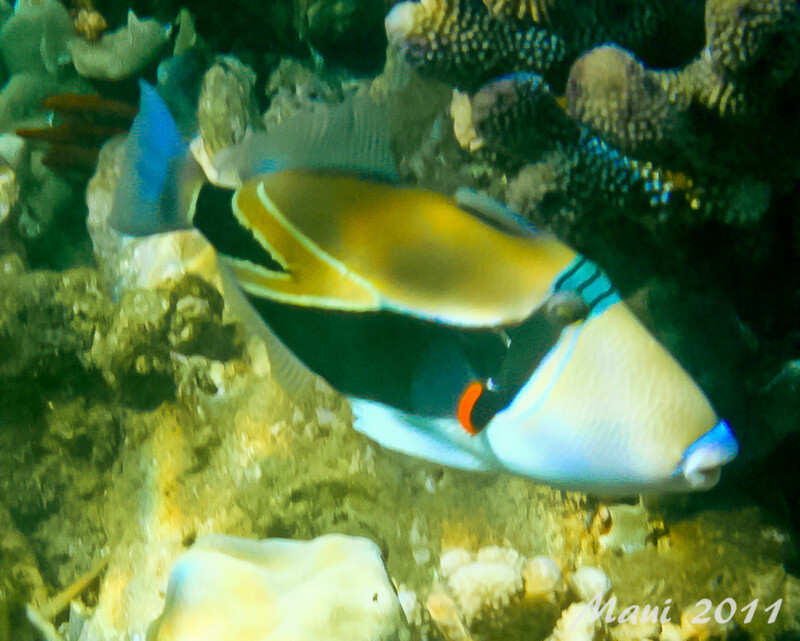 The humuhumunukunukuapua'a is Hawaii's state fish and is well-known for its long name. 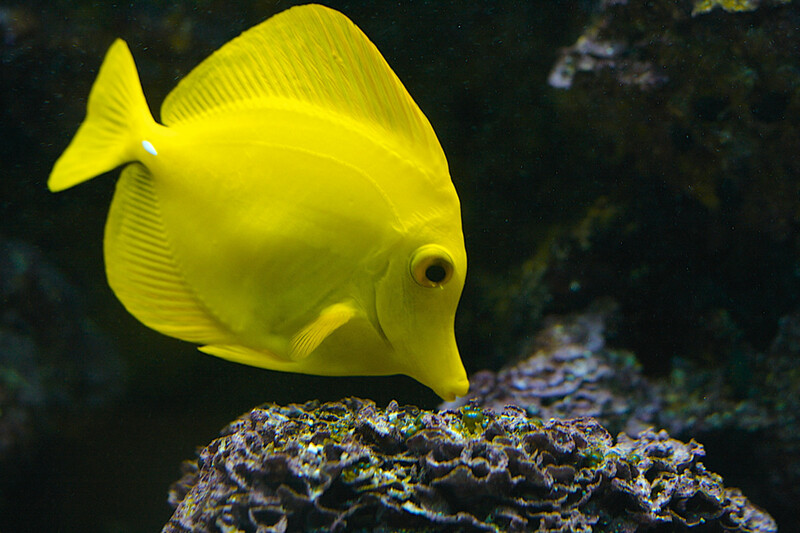 This article will give you all of the facts you want to know about Hawaii's most famous fish. 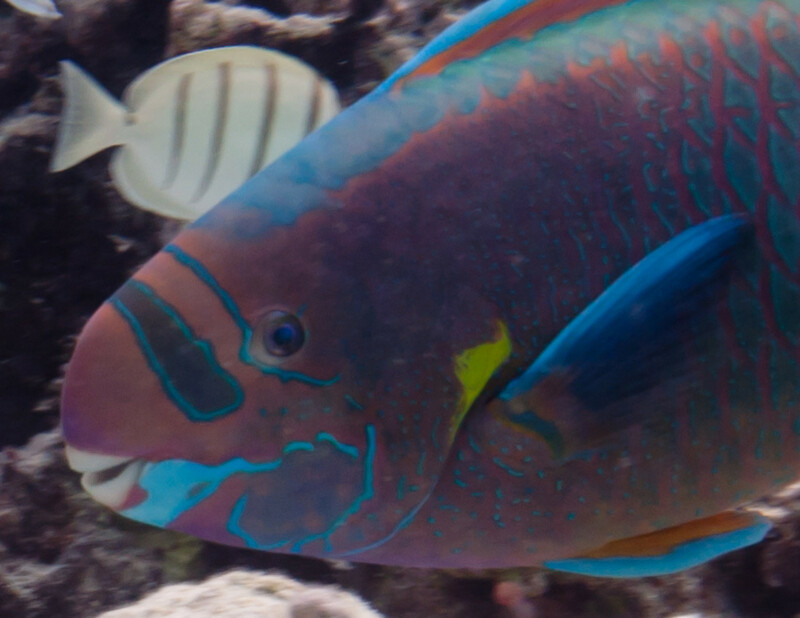 The uhu (Hawaiian parrotfish) is known for the vibrant colors of its scales. The female uhu is mostly a red/fuchsia color, while the male uhu is mostly blue. 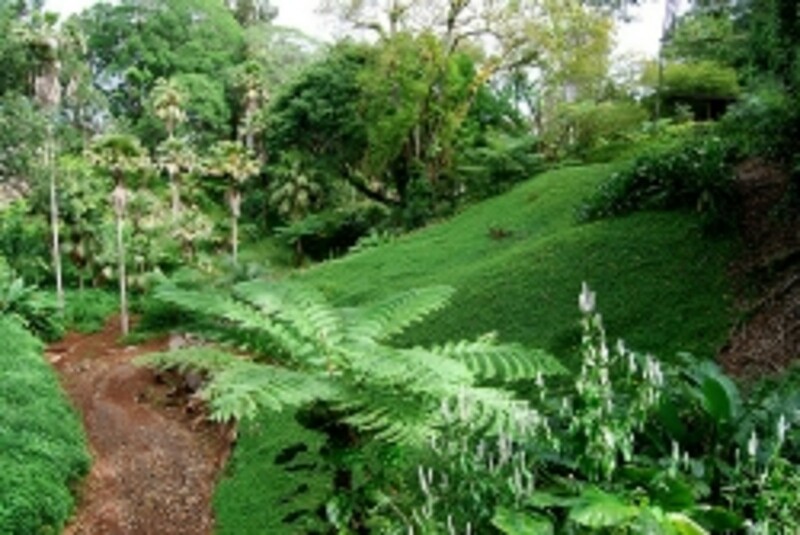 The Hawaiian legend of Puniakaia and Uhumaka`ika`i is a story about a boy who catches a small, female uhu and raises it until it is very large, old and wise. When he releases it with his mother, the boy claims it to be the mother of the sea. Uhu swim in pairs or alone. 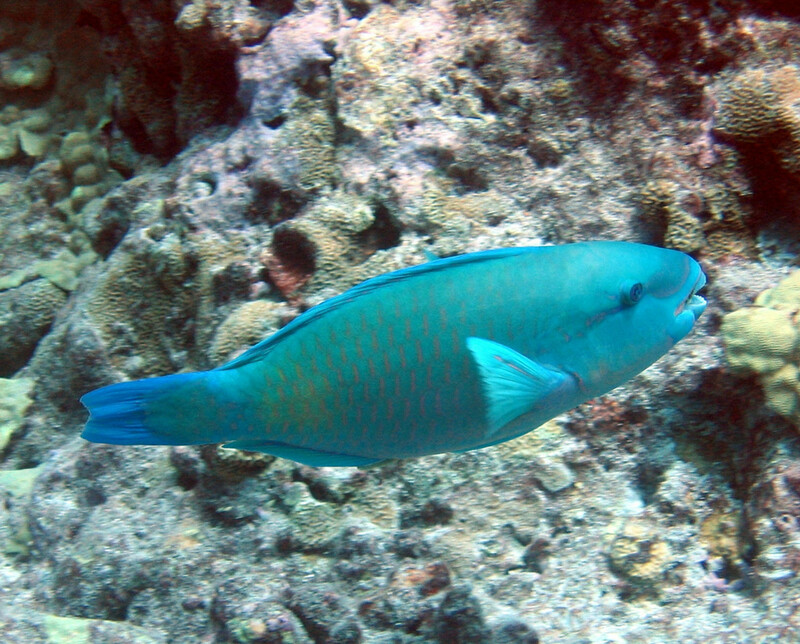 When they see another parrotfish, they swim alongside it. Hawaiians use a unique fishing method to catch this delicious fish. They put a fake uhu in their net and drag it through the water. Another uhu usually joins the made-made uhu and that is how they catch this colorful fish. Hawaiian eels are mostly made up of morays. 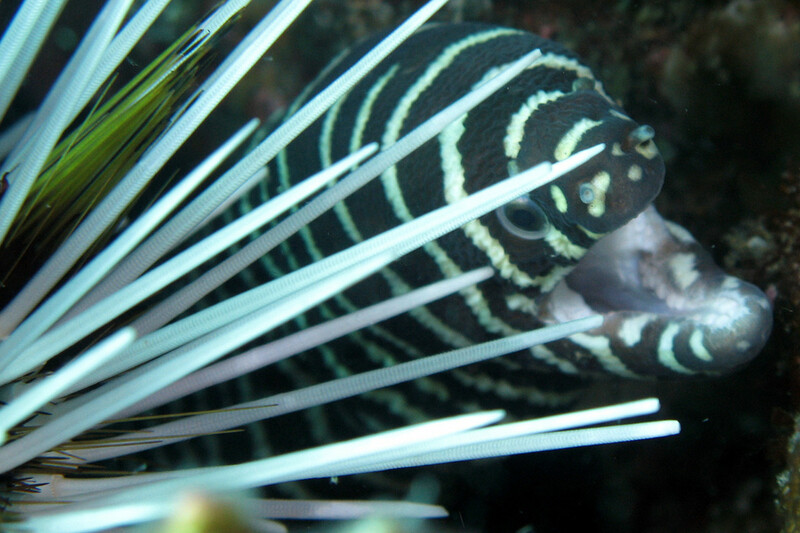 The zebra moray eel is probably the most well-known in Hawaii as it is a common species found only in Hawaiian reef. 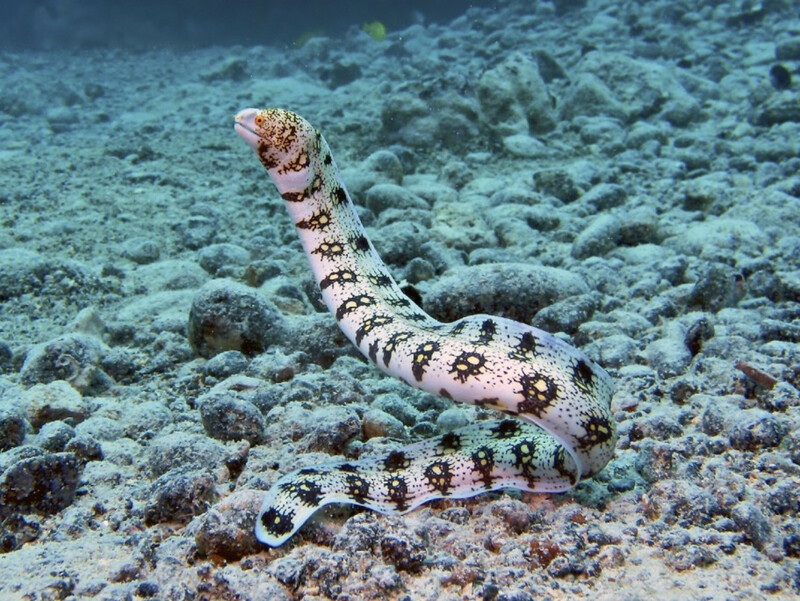 Hawaiian waters are also home to snowflake eels and green moray eels. Some species of Hawaiian eels have a symbiotic relationship with other fish including remoras that are known for cleaning sharks. The eel and the remora have a different type of relationship; the remora will chase the prey into the reef and the eels will chase it inside of the rocks to guide it out and right into the remora. This is the only case of a symbiotic relationship where two species hunt together. This article is about moray eels, the different types of moray eels, moray eel facts, and moray eel photos, plus tips on putting a moray in your home aquarium. 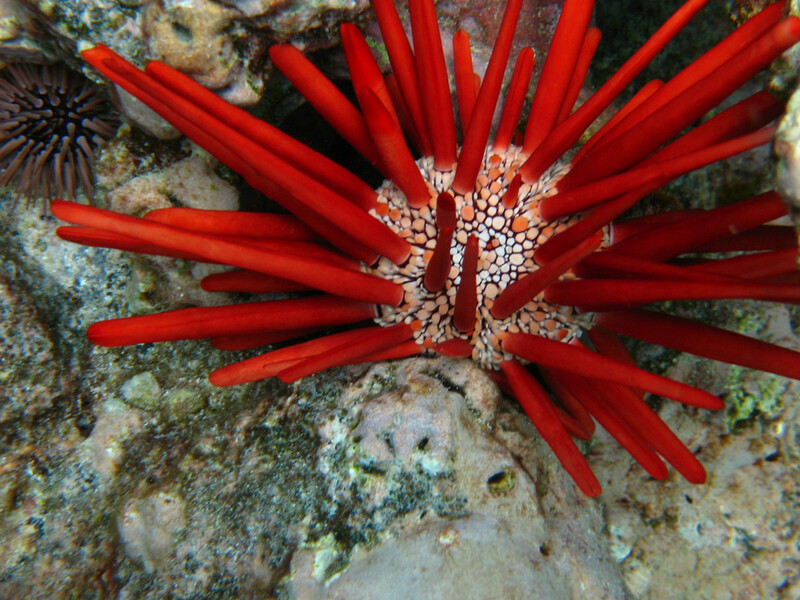 Sea urchins are very common in Hawaii. The locals call them "wana" (pronounced "vah-nah") and try to avoid stepping on them. Sea urchins rest on coral and in the crevasses of rocks. While it is more common to see black wana, the slate pencil wana is indigenous to Hawaii and are much more beautiful. When the wana dies, it leaves behind its spines, which turn a beautiful lavender color. When the spines touch each other, they make a pleasant chime. Handy locals collect them to make wind chimes. I'm so glad I came across this. I've been writing hubs on great snorkeling spots on Oahu, but I'm not that great at remembering fish names. 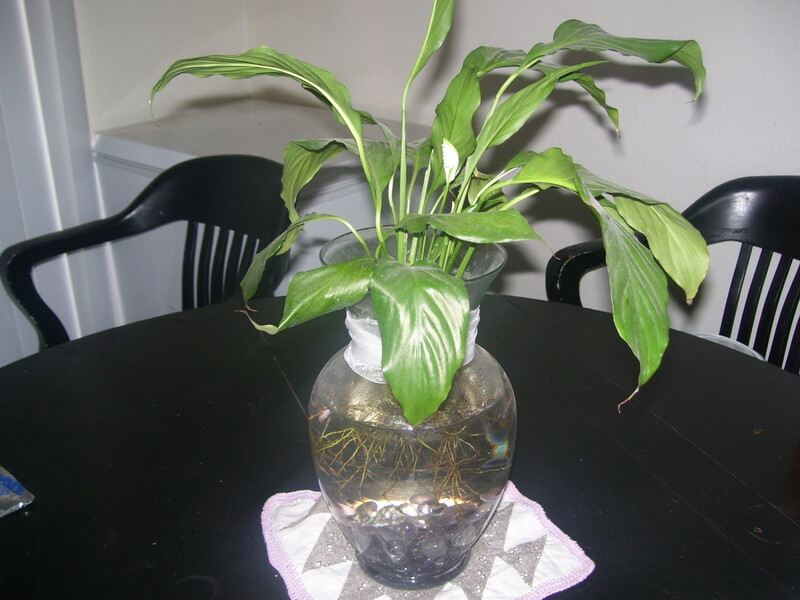 I'm about to link this from my hubs instead of the outside Hawaiian fish page I'd been linking! 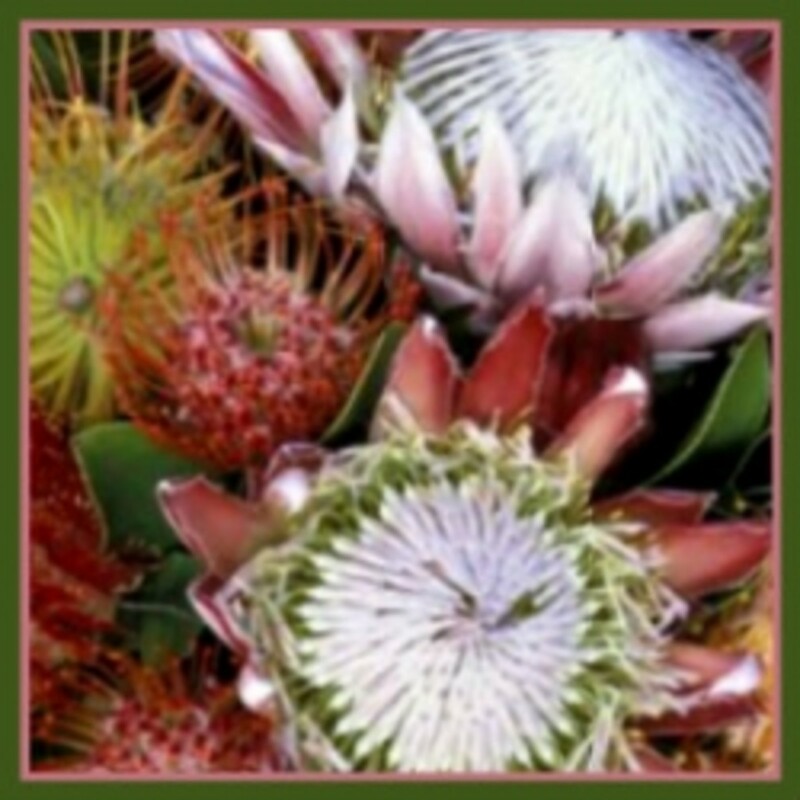 DzyMsLizzy, mahalo (thank you) for your comments! What an interesting connection to Hawaii. My family has been there for six generations and I am moving back there next month. 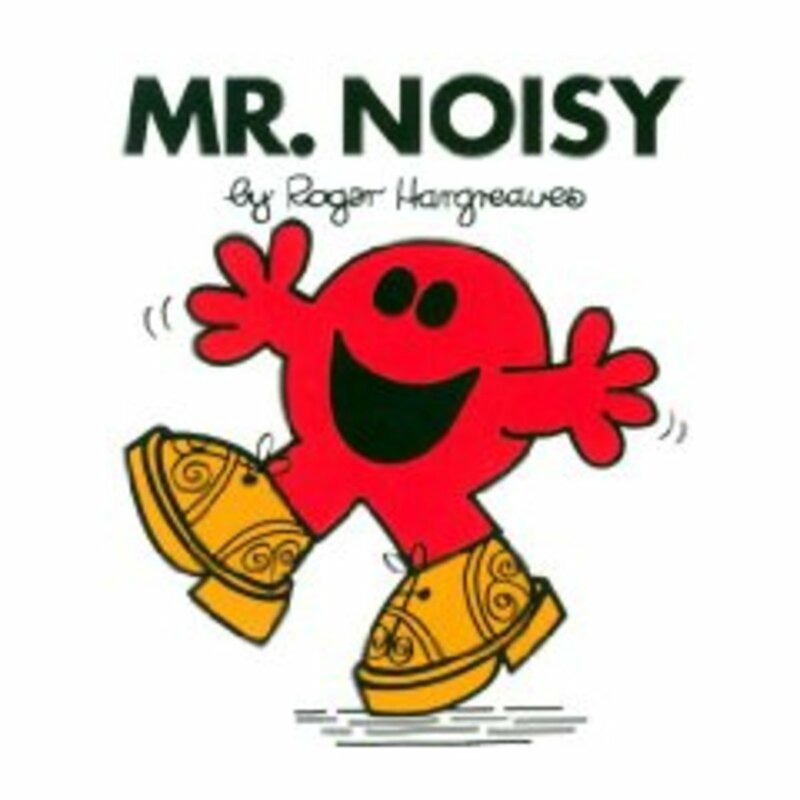 How nice it is to hear that you liked my hub. Thank you so much! I admire your work. What great photos! Very interesting, indeed. I have a very tenuous connection to Hawaii--I've never been there, but that's where my parents met, during WWII (they were both from New England)! 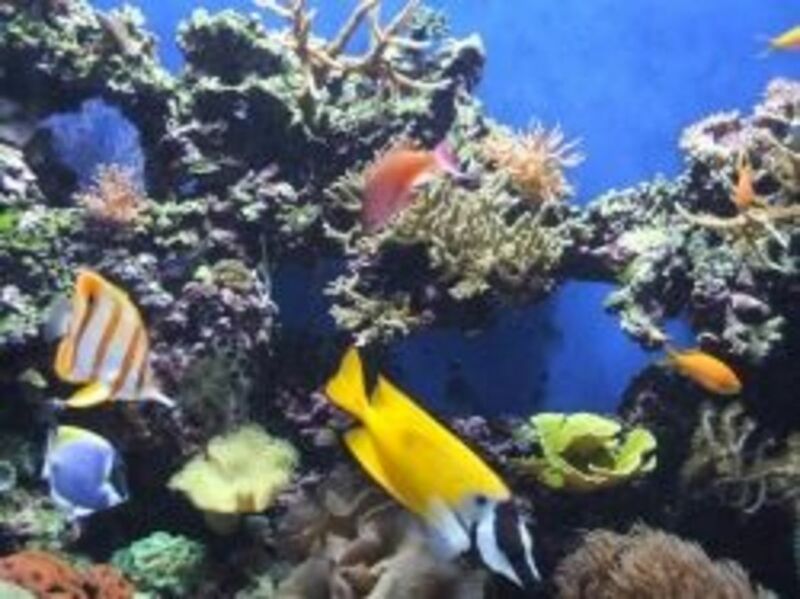 Thanks for sharing this delightful selection of fishes. Voted up, interesting, beautiful and shared. Thank you so much, James!!! I can't wait to check out your writing. Have a wonderful day! This is soooo very cool. You're writing is fantastic and so are the photos.